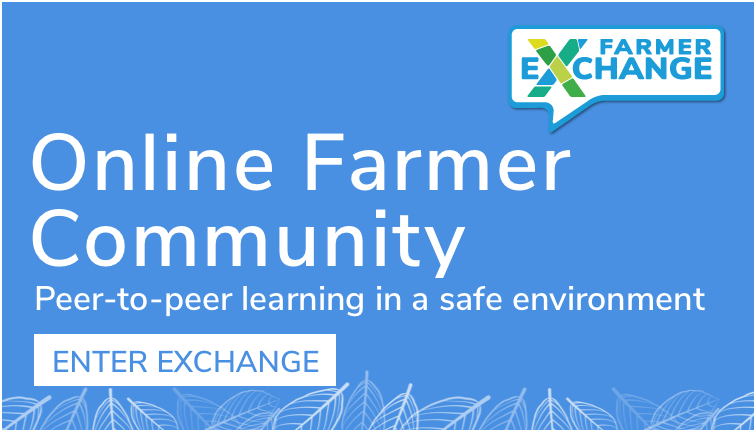 Our first case study comes to you from Carrathool in the Riverina of NSW. We spoke to Julie Armstrong, owner of Corynnia Station with husband Bruce. We are grateful for the insight into her business. Corynnia Station is a very busy farming property set within breathtaking wide-open spaces and a very harsh and often unforgiving environment. 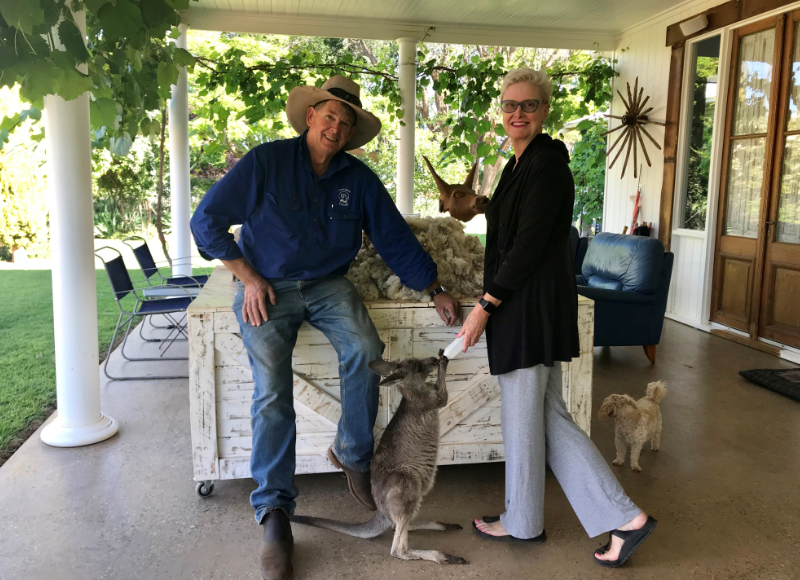 Julie’s labour of love has created a contrasting garden oasis encompasing the historic, stylish and artistically decorated 1930’s homestead and farmstay that Julie and Bruce share with their family, friends, helpers and guests alike. The incredible 360-degree outback skies of the Hay Plains, the unique environment and experiences to be shared is simply stunning. Julie, tell us about you and where you are based? 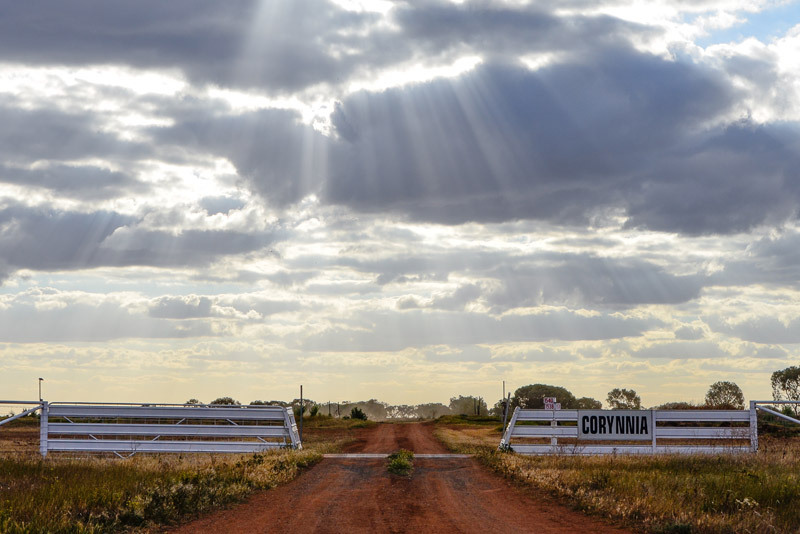 Corynnia Station is owned by Bruce and Julie Armstrong. 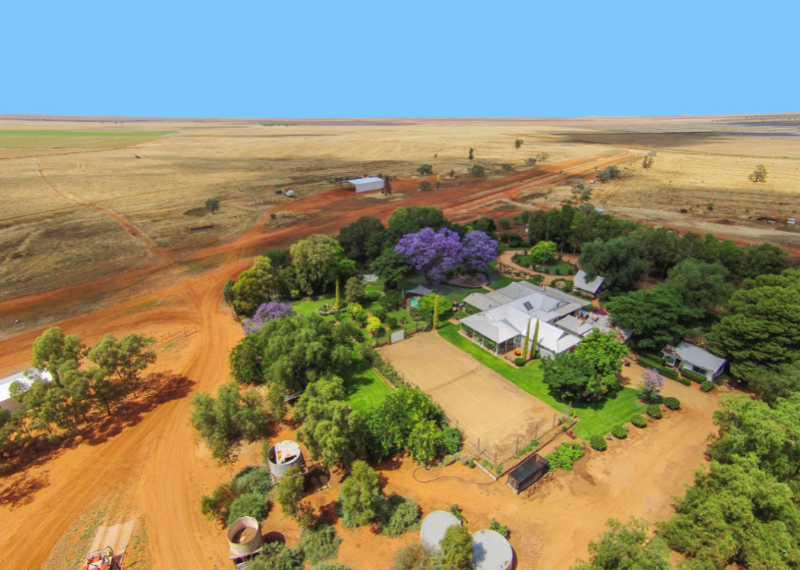 It is a very busy working property growing cotton, sheep feed (rye grass, pasture and oats for hay and grain), with 4,200 quality breeding merino ewes and followers so up to 11,000 stock on property. We have three grown children. Daisy studied a Bachelor of Business and is a water broker in Griffith. Her knowledge and passion for the water industry and her clients is inspiring. Her knowledge certainly is a massive help to our farm planning with the crippling lack of irrigation allocations these days. Our son, Hamish is passionate about agriculture and joined our farm business in 2014 after completing a Bachelor of Agribusiness. His fiancé, Em, lives with Hamish here and they will be married in 2018. Arabella has followed her mothers’ footsteps and works in the fashion industry after studying a Bachelor of Fashion and Textiles at RMIT, Melbourne. She is a planner for MJ Bale (Australian menswear) in Sydney head office. She loves the vibrancy of the city but is a country girl at heart. 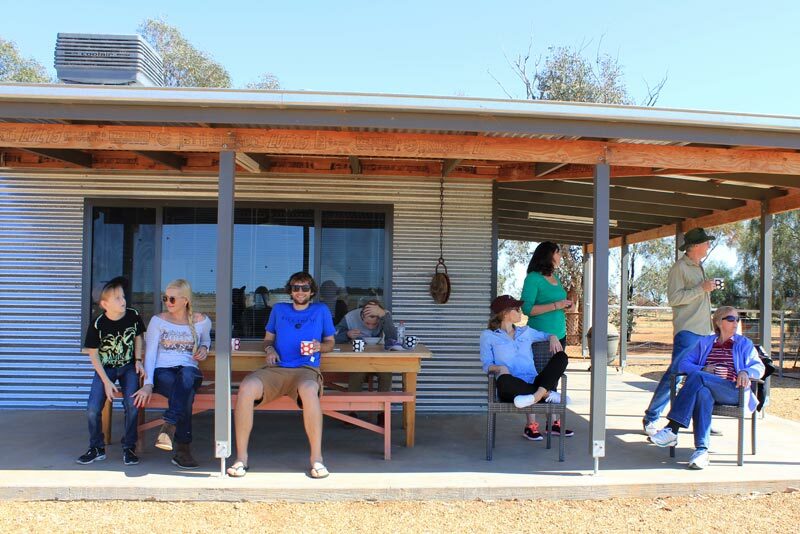 We offer a Farmstay B&B offering an Authentic Aussie Outback Experience ….. In Style! Julie, why did you start the Farmstay B&B at Corynnia Station? The farmstay is really my ‘baby’. The tourism business was a natural progression after over thirty years developing successful fashion businesses. I definitely have a creative, hands-on approach to all I do and it has flowed through into all aspects of my life. With my fashion businesses I was away from home a great deal with lots of travelling so I love the opportunity of having a home-based business. The additional income is welcome of course but isn’t the driver. Passion should always be the driver and the financial rewards will come. For me, passion leads to motivation, which leads to success and I have always been motivated to develop creative, hands on people-based businesses. I love the personal interaction that comes with welcoming guests from all over the world. I am grateful and know how lucky I am to be able to have developed a successful tourism business set within our very special home environment. The farmstay utilises old buildings on Corynnia Station that became vacant due to the changes in property management with contractors helping at key times rather than managing full-time employees. The farming and stock programs are managed and worked by Bruce and our son, Hamish. I manage the office and keep the ‘home fire’s burning’. Firstly, we joined Outback Beds as I had no knowledge of the tourism industry at all. No idea who might ever want to visit us so far from town, how to price our product or how to get word out. We did know that our city friends loved visiting and that I am not a ‘normal’ farmers wife and need people and outlets for my energy and creativity. The business started very slowly as it was just when people were starting to get hooked into the internet. A wise friend with a B&B in Hay told me it would take five years and she was absolutely right. In 2014 we joined Trip Advisor, Booking.com, Expedia and a couple of Pet Friendly travel websites. That following year we experienced a 900% (yes 900%) growth in 12 months and wonderful reviews by our enthusiastic and generous guests gave us a Five Star Trip Advisor Rating and Certificate Of Excellence awarded to us every year since. We are the number one accommodation in our area which is really something we are thrilled and proud about. Last year we experience a further 100% growth in one year. We actually don’t want to take o too much more as the farm is our priority and I want to be able to enjoy our guests – not churn them through. I am not looking for 100% occupancy or anything like that. I like that we have guests in most nights but also have the odd week that is clear so I can regroup and catch up on other things that need attention. My life is certainly a juggling act but so much fun! It suits me perfectly. What have been the major successes with the farmstay venture? There are so many! From the happy, enthusiastic, fun, interested and interesting guests, to sharing our lives with the world. We love the joy of welcoming returning guests and guests referred by our ‘fans’. Julie told us that it is such a privilege to welcome returning guests and helpers and guests – often with their families or friends. These wonderful people experience a real farming family, in the real Aussie Outback where farming and life on the land is physically, mentally and emotionally challenging. Agriculture is Bruce’s and Hamish’s passion and they wouldn’t want to do anything else. This whole incredible world has opened to us since welcoming guests into our lives and onto our property. Not only interesting, interested and enthusiastic guests but young volunteers and Grey Nomads who come to offer us some help and in doing so experience our life. It is always a sad day when they move on but they usually leave as a special part of our international family and we keep n touch’ said Julie. Like the core farming business, the daily satisfaction of a job well done, is such a key driver. Corynnia Station has been awarded Trip Advisor Five Star Guest Ratings and Certificates of Excellence every year since joining in 2014 thanks to the generosity and enthusiasm of their guests and all involved in Corynnia Station on so many levels. 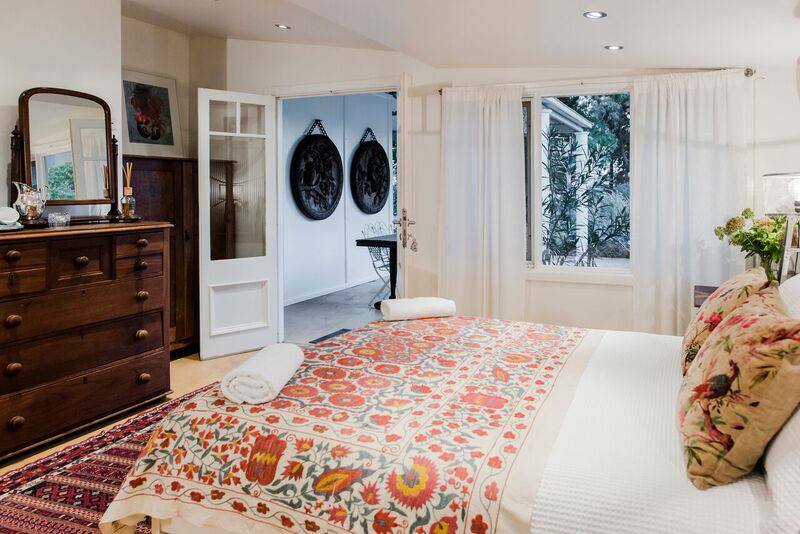 The farmstay has been featured recently on Sydney Weekender and in many travel publications. 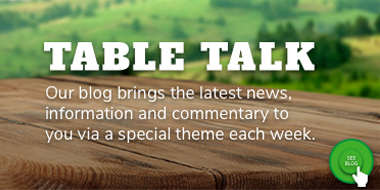 What have been the major challenges in setting up and running the farmstay venture? Sourcing help is a certainly a challenge as there is no available labour nearby. Because of this, I have had to ‘look outside of the square’ as to what options there may be. This has led us to welcoming young travellers with whom we have shared their home with more than 80 since 2010, said Julie. We keep in touch with many of these amazing young people and count them as our ‘kids’. They often return or bring their overseas families to stay with us and we visit them and their families if we are overseas – an incredible exchange of environments, families and friends. For the couple of years we have also have been welcoming more Grey (or not so grey) Nomads who are keen to stay for 3 to 6 months and get their teeth into something so different to their past lives. They often stay for a lot longer because they love it here as much as we do and are part of our ‘family’, exhibiting the pride that comes with feeling an integral and important part of Corynnia Station and the Armstrong Family. Julie, do you have any advice for others looking into diversifying their farm business? Don’t think of welcoming tourist if your motivation is to make an easy dollar. Like any business, it isn’t easy. You have to have passion, commitment, a genuine love of people and be willing to openly share your environment with others. Like any successful business, owners have to be absolutely particular about all aspects of the business. For us this is cleanliness, comfort, good food, genuine hospitality, up to date technology (including website and social media) and the list goes on. It is a pleasure to do it all if your heart is in it and you genuinely like people but it certainly isn’t for everyone. You certainly have to be a ‘people’s person’. I found going the group ‘Outback Beds’ was a big help when we started and it is great to have mentors who have been in the industry for some time. It is also a great way to share ideas. Also, I recommend to attend workshops that are available such as tourism seminars or social media training which also assists in the building of new skills. My key bit of advice would be that don’t think you can do everything. Learn where your time and skills are most valuable and get help with other parts of the business as it develops. 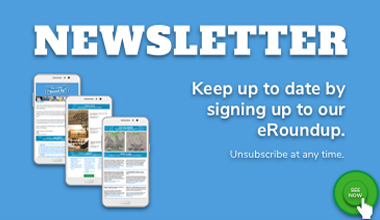 I tended to do it all when I first started but now the farmstay is so busy, I have day to day help and employ specialists to manage our website and social media. Don’t try to be everything to everyone and there are always people who will not fit in or won’t be happy – that is such a challenge for me as I put in my heart and soul, as do our helpers, and we want everyone to love this place as much as we do , ‘ Julie says. ‘Luckily the 80:20 rule doesn’t apply here – it is more like 98:2 so we are grateful that most of our guests are such fans’. Finally, always be professional but ‘share the real you’ – your passions and enthusiasm. Our guests and helpers love that and that and understand that sharing is what makes our lives on Corynnia Station so special. Thank you so much Julie and congratulations on such a successful business. Where can people find you? They can find us at www.corynniastation.com.au, on Instagram @corynniastation or on Facebook https://www.facebook.com/corynniafarmstay/. We are so lucky for this insight into an incredibly successful and impeccably run operation. Stay tuned for the next case study.